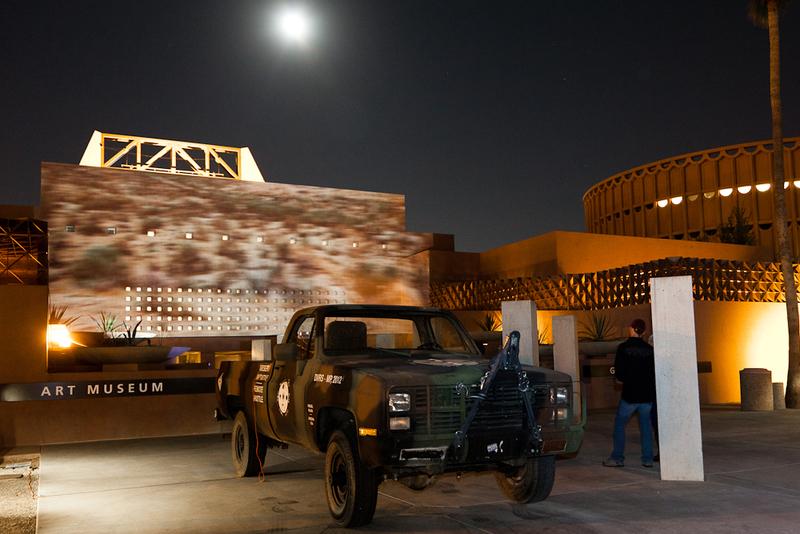 At 6:30 on the evening of September 28, the ASU Art Museum launched its 2012 season. 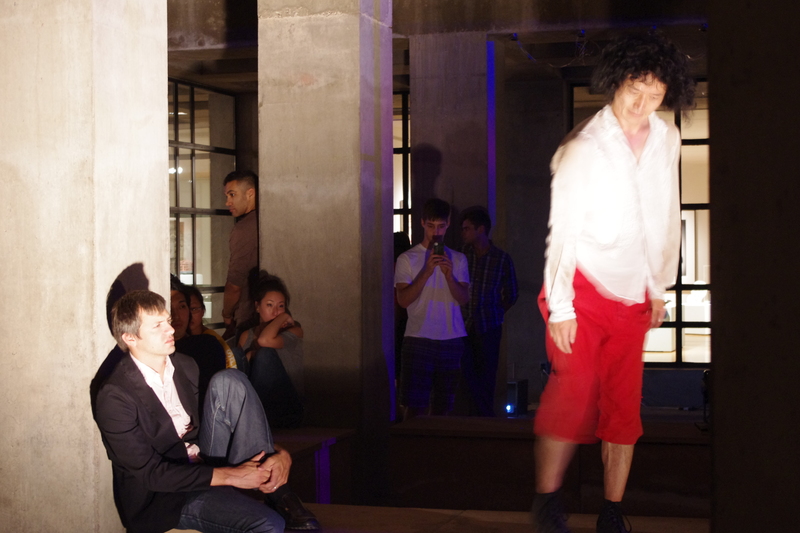 People gathered in the darkness at the front of the building to talk, eat and watch a performance by the mixed parkour, martial arts, dance and acrobatics group Movement Connections. The group, dressed in white, took advantage of the museum’s unique structure as they silently crawled, leapt and ran all over the walls and stairs of the Art Museum’s entrance. In a touching moment, a little girl got caught up in the mix and one of the performers invited her to perform a stunt with him—a simple handstand, nothing dangerous. After performing a few more acrobatics on their own, eventually the performers climbed up onto the cement pillars in the front of the Museum. 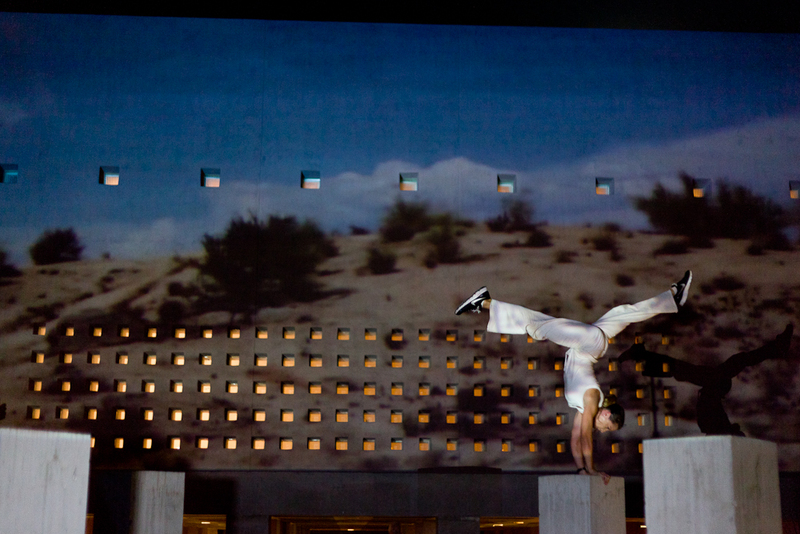 They performed a few stunts and then began pointing toward the façade of the museum upon which a video was being projected. It appeared to have been filmed from the window of a car and depicted an expanse of desert landscape rushing by. 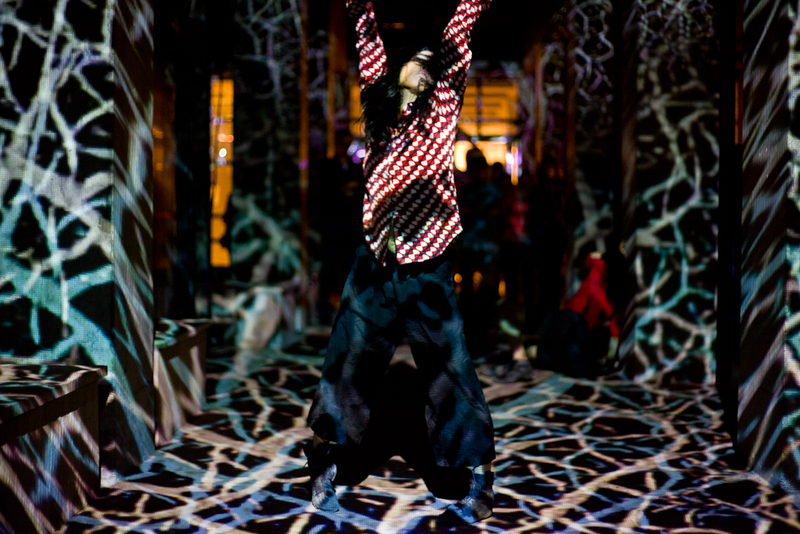 The video continued to play as Movement Connections wrapped up their performance. People then began to shuffle down the stairs, waiting for the next sequence in the evening’s activities. 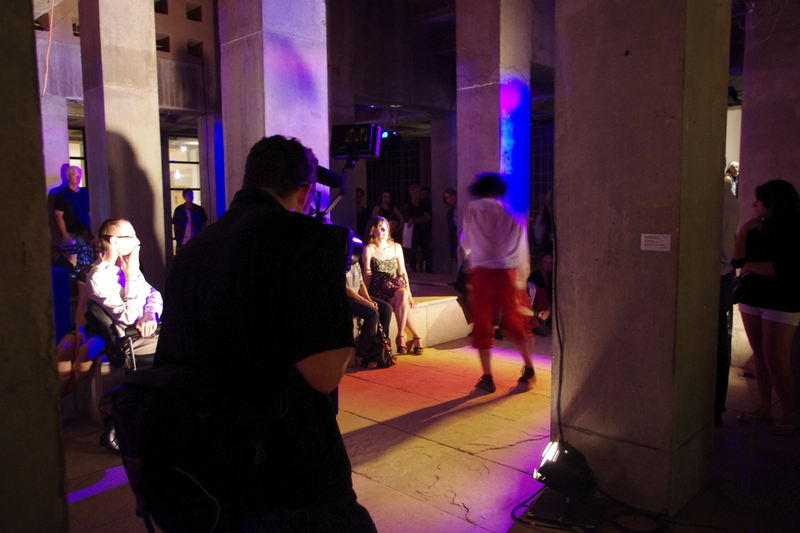 Some ventured into the Museum to look at the current exhibits on display, while others, like myself, sat just outside the doors, taking in the array of lights that filled the underground courtyard—part of the “55: Music and Dance in Concrete” performance that would start at 7:30 p.m. 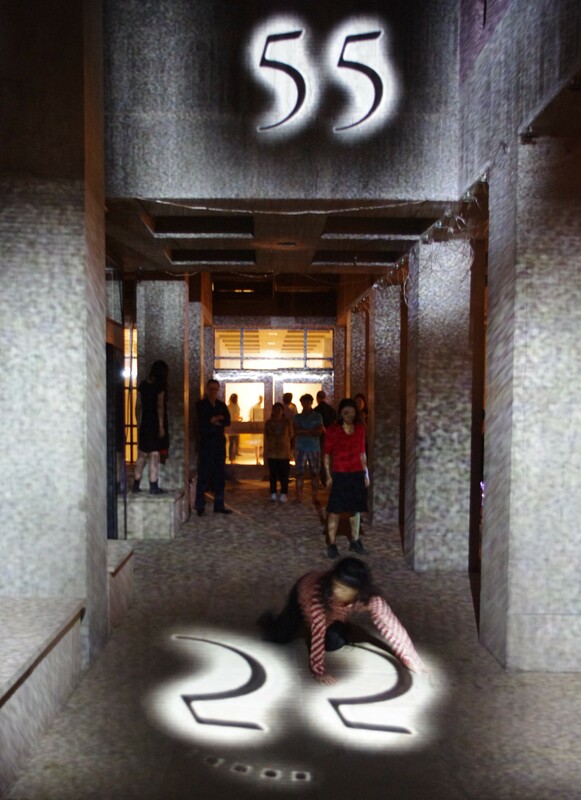 I sat to one side of the courtyard and began to notice other elements—a video of an eye opening and closing and rolling around in its socket was projected onto the back of the pillars that outlined the courtyard. Above and below the eye was the phrase, “Don’t touch me! !” projected backwards. It was somewhat disturbing,and I did not know what to expect from the performance after seeing these images. Just before the performance began, the audience was instructed as to where to stand in order to best view the performance, but were also told that the performers would be moving throughout the space alternately providing various vantage points a better view. The crowd gathered, and from my vantage point I witnessed three of the visiting dancers, each dressed in red, black and white, slowly fill the empty space between us and the Museum. I could not see what was happening on the other half of the courtyard as it was blocked by cement pillars and benches, but this was how the show was meant to be viewed: people seeing different parts of the show, each person having a unique viewing experience. The three girls on my side slowly moved into position. 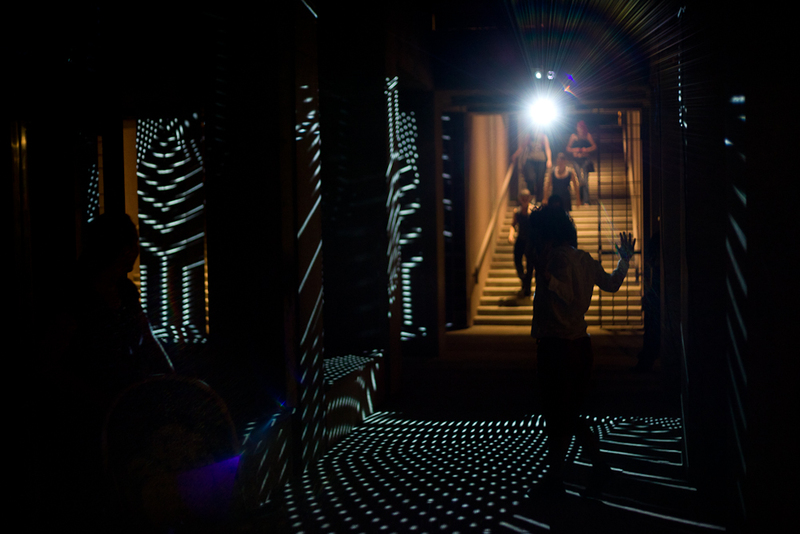 The lights changed from bright white lines filling the space to a strange speckled effect, and music composed of electronic sounds, “from 55 improvised and 55 composed pieces” started to play. The dancers began to move. Their dancing was rapid; they moved convulsively, throwing themselves at the cement walls and against the floor as the lights continued to change and pulse. The effect was alarming and intriguing. As the dancers moved throughout the space, the crowd adjusted to watch each new scene; at one point the only male dancer shut himself behind a gate while a video of him stuck in what seemed like a jail cell played on the wall behind the bars. The video cut from scenes of him in the cell, to the real dancer performing similar movements in the real, jail-like space. The music and lights continued to change as the dancers set and reset their stage, from one side of the courtyard to the other, to behind the bars, to on top of the cement benches, to at one point taking the elevator in the middle of the space up to the second floor where we lost sight of them for a moment. 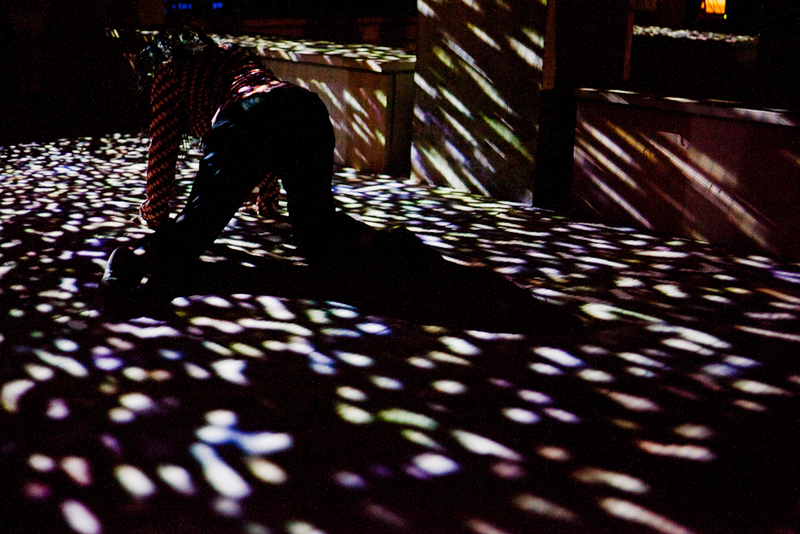 The performance, meant to engage the audience in sight, sound and movement, felt like a piece about escape; the dancers’ jerking movements gave the impression that they were almost trying to break out of their own skin. What was most beautiful about the whole event, however, was not only the performances, but the interaction between the performers and their audience. I looked over the faces in the audience and everyone’s eyes were on the performers, completely captivated. The decision by both performance groups to use the space around their audience created an atmosphere in which we were all connected. Not only did everyone get to watch a fun and intricate performance, but they were encouraged to feel like they were a part of it all. Thanks to Sean Deckert and Veronica Rascona for the use of their photographs. 55: Music and Dance in Concrete premiered at Fort Worden as part of Centrum’s Reverberations series, in addition to premiering at the ASU Art Museum. The project received initial funding from the MAP Fund and the Doris Duke Charitable Foundation, as well as support from Arizona State University, and RBMA. The project is supported by the Japan Foundation through the PerformingArtsJAPAN program. The Centrum Artist Residency program is made possible by support from the Washington State Arts Commission and the Washington State Parks and Recreation Commission. Additional support was provided by 4Culture Site Specific. Miguel Palma’s Trajectory is supported in part by the FUNd at ASU Art Museum, the ASU Art Museum Advisory Board and Friends and Margarita and Willie Joffroy. Entry filed under: Art + Performance, Art Events, Artists at the Museum, ASU Art Museum, ASU Art Museum International Artist Residency, ASU Art Museum Press, ASU Art Museum special events, ASU Art Museum: Behind-the-scenes, Exhibition Openings, People at ASU Art Museum, Uncategorized, video art. Tags: 4Culture Site Specific, 55: Music and Dance in Concrete, Arizona State University, Arizona State University Art Museum, art, artist, artists, Artists at the Museum, ASU, ASU Art Museum, ASU Art Museum Advisory Board, ASU Art Museum International Artist Residency Program, behind the scenes, Centrum, Centrum Artist Residency, community, dance, Doris Duke Charitable Foundation, electronic music, event, events, exhibition, family, Fort Worden, Francesco Caban, free, Friends of the ASU Art Museum, FUNd at ASU Art Museum, gallery, Gordon Knox, Herberger Institute for Design and The Arts, Japan, Japan Foundation, KINGYO, MAP Fund, Margarita and Willie Joffroy, Miguel Palma, Movement Connections, museum, non-profit, opening, performance, PerformingArtsJAPAN, Port Townsend, Portugal, project, RBMA, reception, Sean Deckert, Seattle, Trajectory, travel, Veronica Rascona, video, video art, Washington State Arts Commission, Washington State Parks and Recreation Commission, Wayne Horvitz, Yohei Saito, Yukio Suzuki.